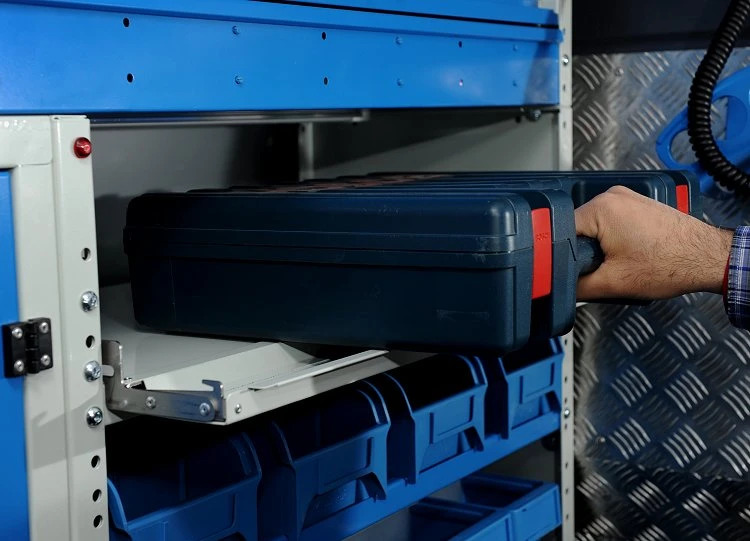 It is nearly twenty years that Syncro System has been upfitting vans. 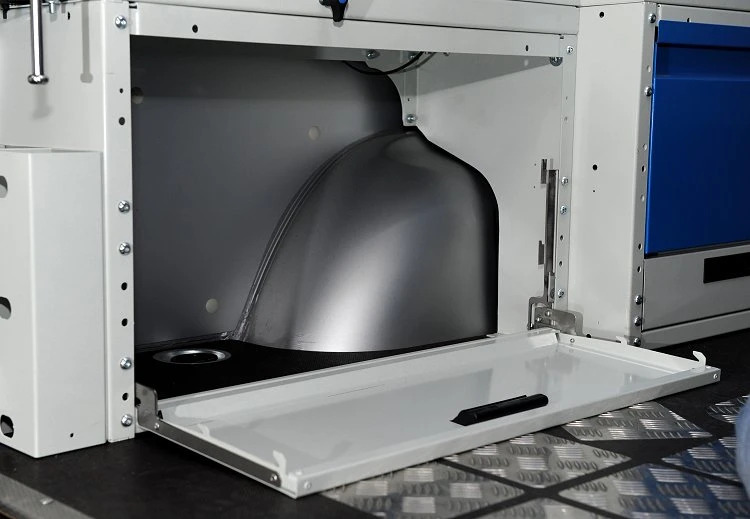 We know that listening to our clients and those who work in and out of their vans is the very best way to find the ideal upfitting solutions. 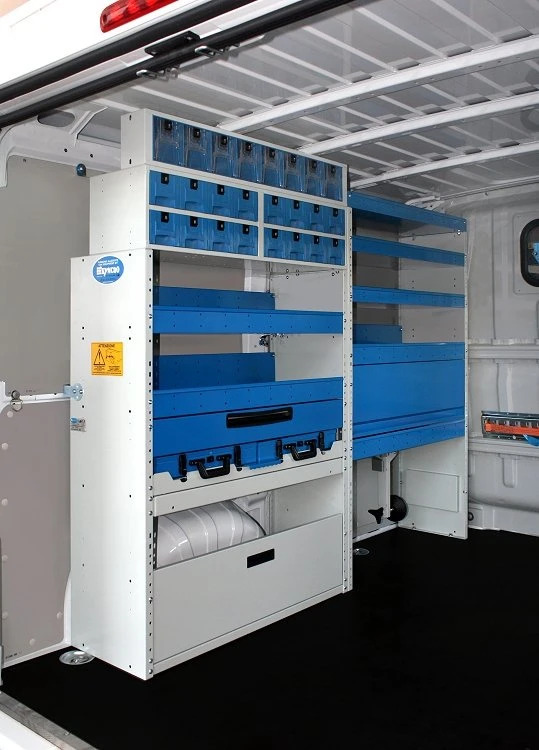 And not only for each individual client, but also to work towards designing new, innovative and practical designs that will make your working van really work for you. We are proud to introduce our new door panel incorporating a rotational sliding system – an innovative solution that allows the door to be completely free of protruding parts. Certainly a much appreciated quality in vans where space is always at a premium. 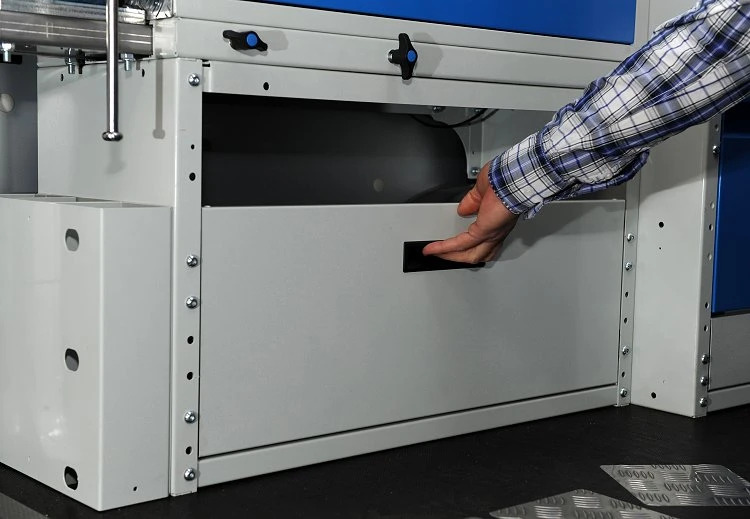 In the open position, as well as rotating, the door shifts to the outside, allowing easy access to the shelving compartment. To open the door, you lift it upwards and then pull it outwards. 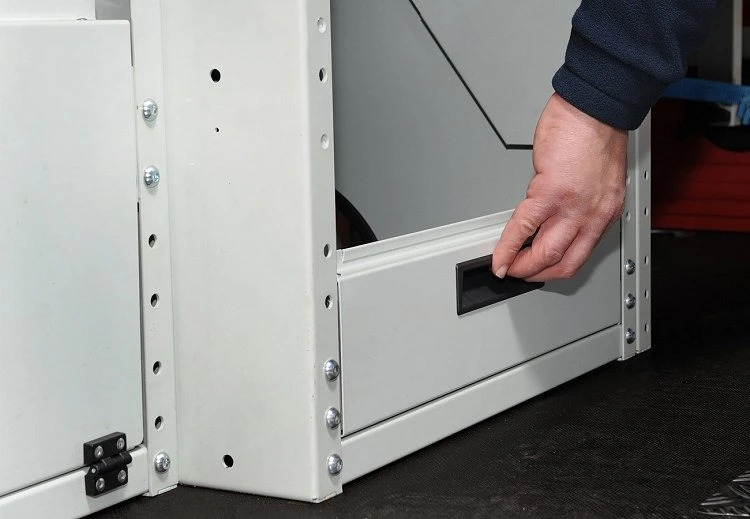 The hinge mechanism swings it to the open position basically leaving the the entire opening of the compartment free for easy loading and unloading. 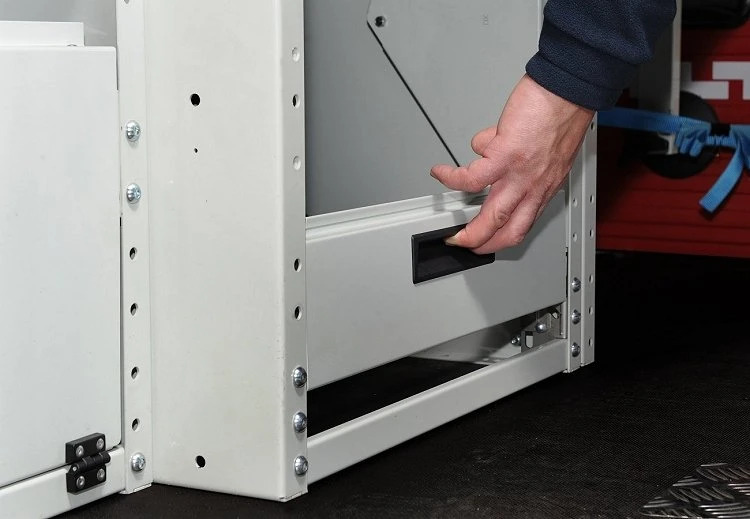 To close it, you must push it inwards, and the hinge mechanism once again swings it back into the closed position and it is automatically blocked shut. 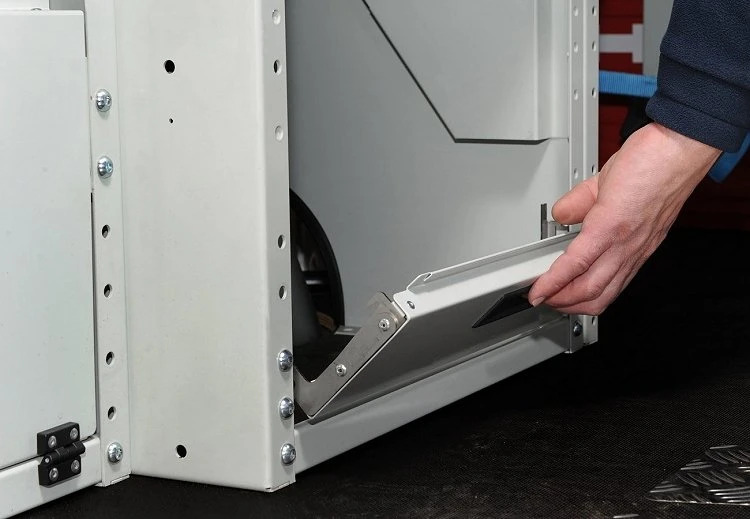 Each door panel is equipped with a recessed handle, so there are no protruding parts. 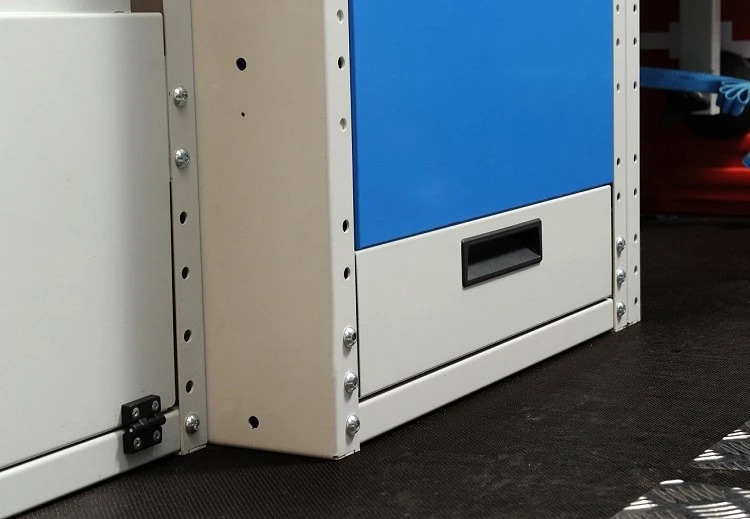 When open, they are out of the way and the hinges are positioned flush against the two sides, so they also don't get in the way of loading and unloading. 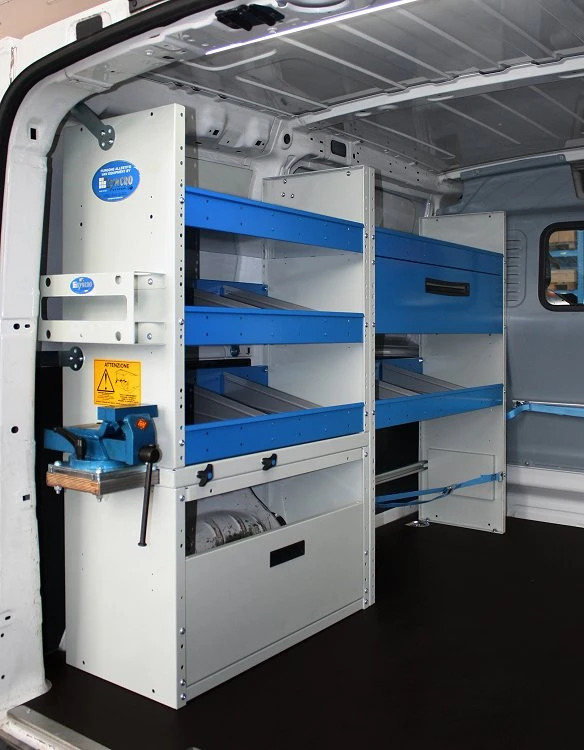 The door panels are made in high-strength steel making them long-lasting and resistant to the wear and tear all working vans endure daily. 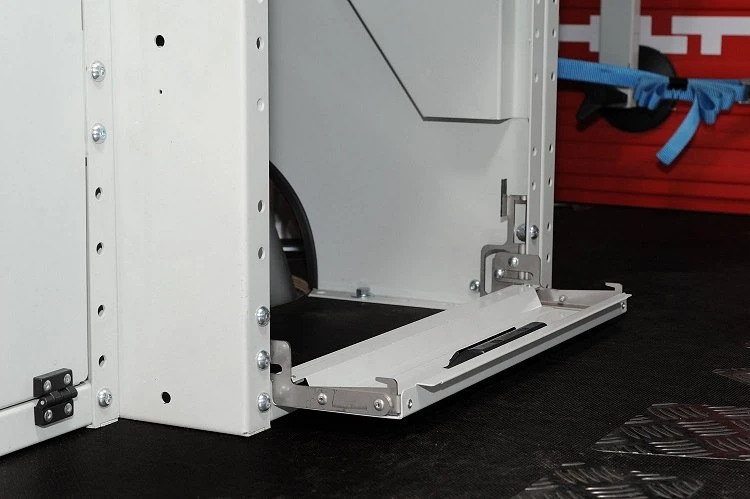 The hinges are made of stainless steel - extremely strong and maintenance free. and two lengths: 50 cm and 150 cm. The 130 mm model can be combined with the parallelogram hinge or used by themselves. 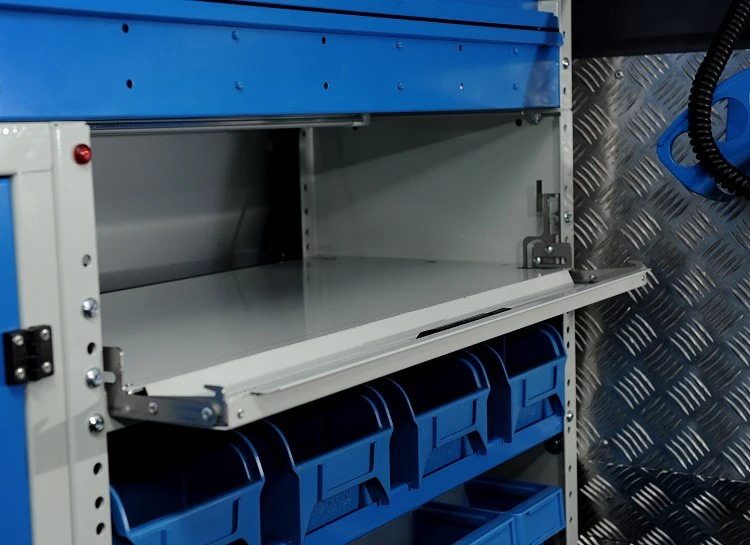 Both the 130 mm and 295 mm models are compatible with the RS series flat shelves, creating convenient wide open access to easily store boxes, cases, tools, and materials. 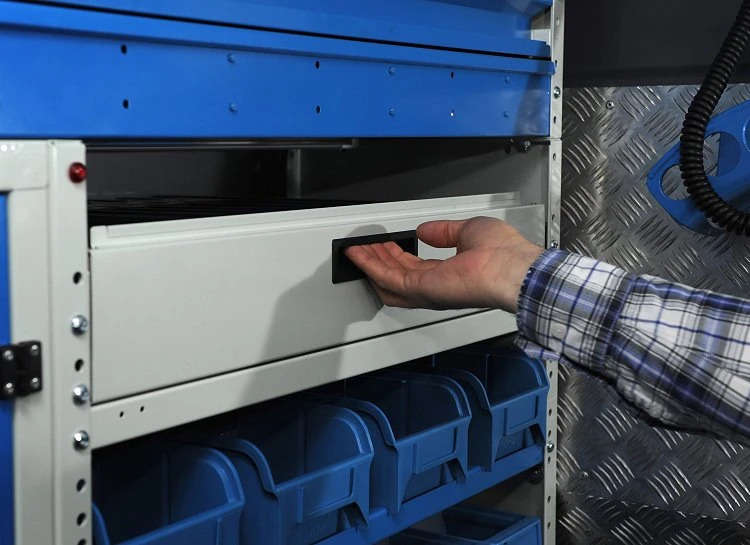 A further advantage of these new door panels is their compact design, which allows mounting even on shelving units which have a width of only 160 mm. 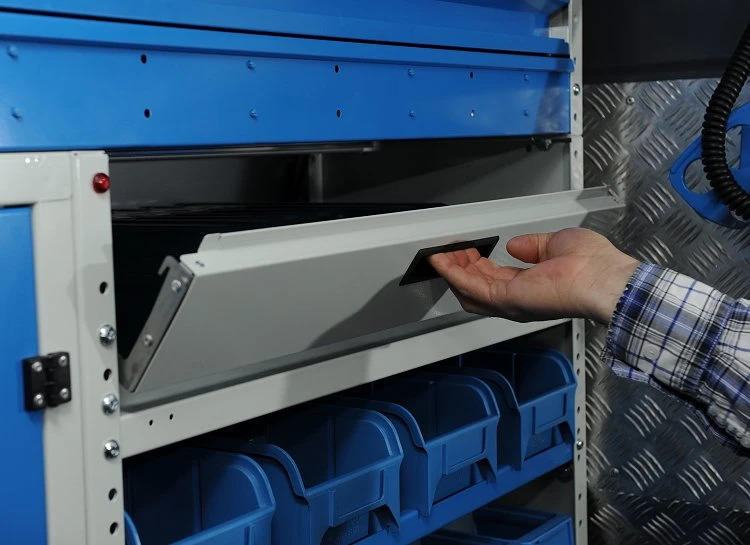 The new 'wide-open' door panels with rotational sliding system can be used in combination with the RS series shelves. 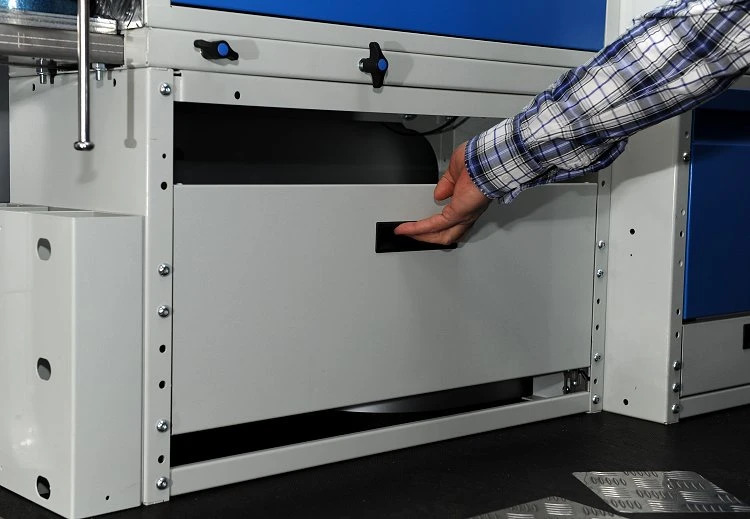 In this case, the door panel is positioned so that it does not block access to the equipment stowed on the shelf. 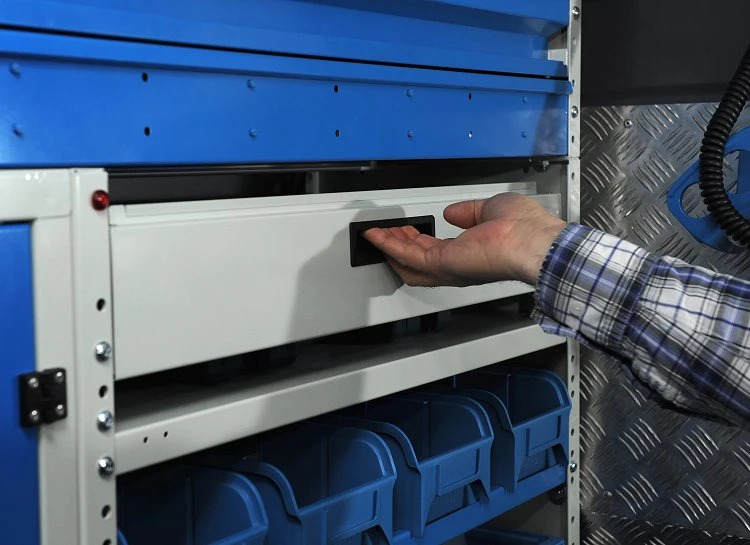 Thanks to slots in the shelves, the door panels can be directly fixed to the shelving units without having to use the angular bottom piece, which is necessary when the panels are placed along the floor board. Here we see examples of two vans upfitted using the new door panels. 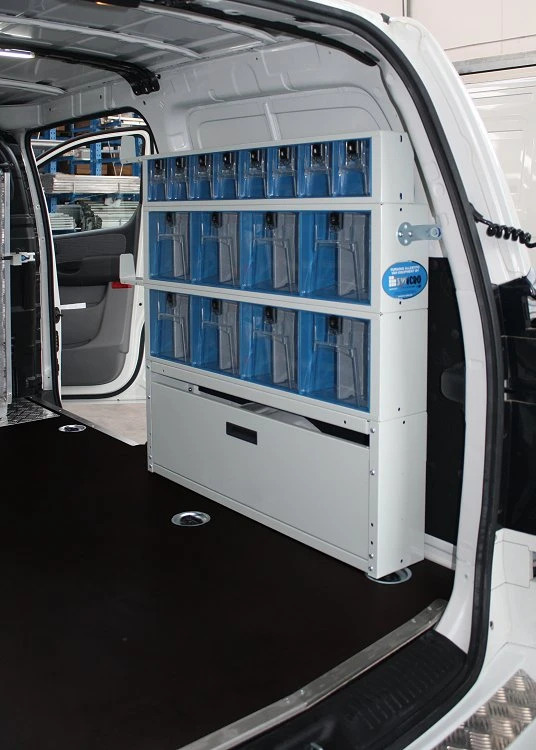 The Fiat Scudo has a simple 353 mm wide shelving unit and an upfit with clear plastic drawers on the Hyundai H1. 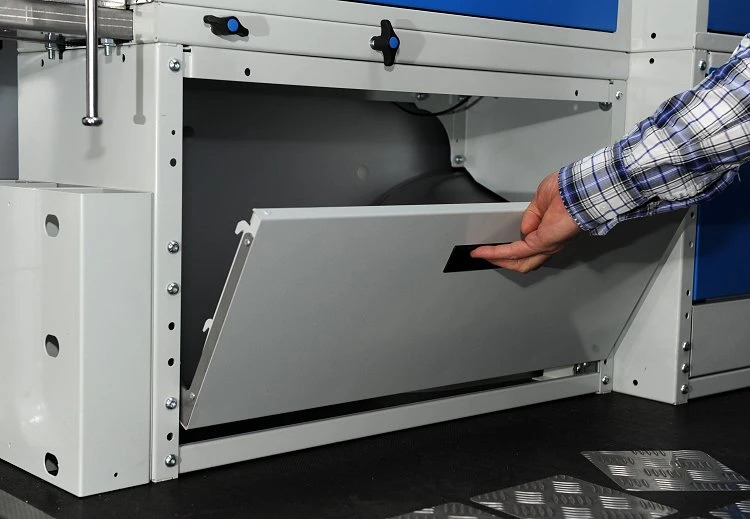 On the Hyundai, it is easy to see the advantages of the door's compact design that has been mounted on a unit only 160 mm wide.